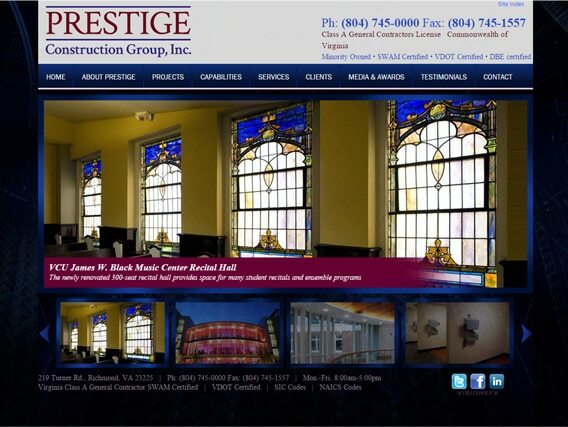 Website design building contractors Richmond VA | VISIONEFX web designers in Virginia Beach, VA redesigned a website for the Prestige Construction Group. Prestige approached VISIONEFX after frustration with their previous web company for timely updates and fixes. After a complete website redesign by VISIONEFX website maintenance and updates are no longer a problem for Prestige Construction. When searching Web Design Richmond VA – Web development Richmond VA look no further than VISIONEFX . The team at VISIONEFX can design a custom website and provide ongoing website maintenance plans for your company. VISIONEFX, is a Web design company based in Virginia Beach, VA providing extraordinary web design for small and large businesses throughout the United States to include; custom web design, web development, e-commerce web design, Word Press web design, Joomla web development, SEO and web maintenance services. Call: (757) 619-6456 or email info@visionefx.net.